I was asked to put together a tutorial for this quilt. So here it goes! 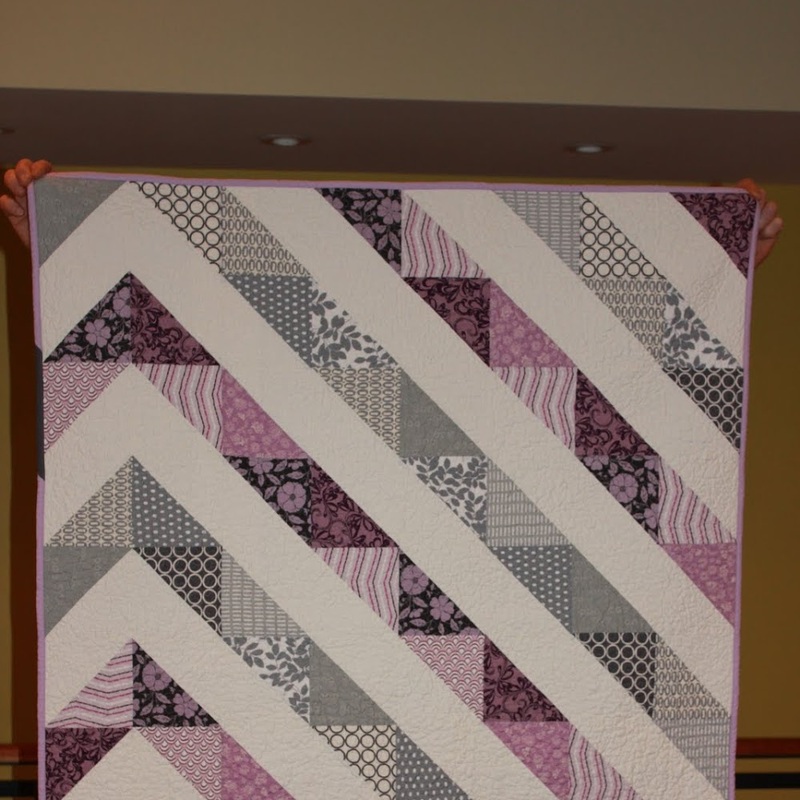 Seems like it was just yesterday that I was scouring the internet for tutorials on how to put squares together and tips and tricks on quilting. So I am going to give it a try. The quilt I made has different fabrics (4 solids and 1 stripe). There are actually 4 fabrics used in each block ... so each block is missing one of the fabrics. I have never been able to sew a 1/4 seam allowance. My machine is metric and I haven't been able to mark a 1/4" seam allowance very well. The widths are what are important to pay attention to in the following instructions, as I prefer to sew on the next piece and then trim it up once its is sewn. So here goes ... I have thrown in the reference color from the photo to make it easier on your first block. 1 - 4" x 11.25"
1 - 4" x 7.5"
2 - 1" x 6.5"
2 - 1" x 7.5"
1 - 1.5" x 4"
1 - 1.5" x 5"
1 - 2" x 5"
1 - 2" x 6.5"
1 - 1" x 3"
2 - 1" x 3.75"
1 - 3" x 3"
This block assumes .25" seam allowances. 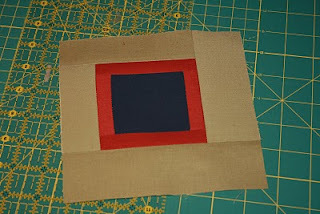 Step 1: Start with the 3" square (Fabric 5 - navy) and sew 1" strips (Fabric 4 - rust) around the perimeter. As I mentioned, I cheat a little ... while you can precut both the width and length of the strips ... I often will cut the with first and then trim it up after I sew it on. Step 2: Next, add Fabric #3 (Green). Note, there are two different widths used of this fabric ... 1.5" and 2.0". In the picture, you'll note the top and left strips are 1.5", while the right strip (and eventually the bottom) are the 2". It's important to make sure you put the same width strips adjacent to each other (as opposed to opposite), otherwise you end up with a rectangle, not a square. 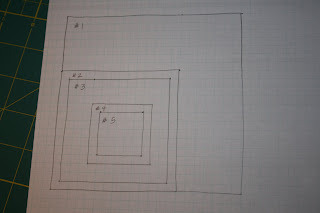 Having these strips different widths, gives the center box a feeling of "floating" in the larger box. Step 3: Fabric #2 (stripe) is all the same width wrapped around. Be careful, however, not to stretch the material when sewing or ironing. When strips are this narrow, they can get stretched out of shape quickly ... one of the reaons that I measure with and then trip to length ... that way if I'm off by an 1/8th of an inch, I don't have to stretch it to match. 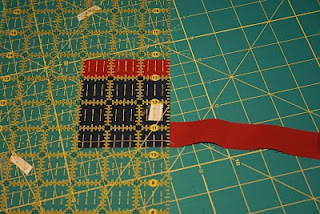 Step 4: In this step, you're going to add the final layer of the box (Fabric #1 - navy) ... there are only 2 in this step. Again, if you're not perfect with your 1/4" seam allowances, it could be helpful to trim up length at the end, instead of precutting for length. Because you had different widths of Fabric #3, the box now has a top and a bottom. It doesn't matter which is the top or bottom. 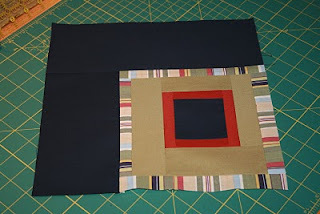 If you want uniformity in the final layout (like I did mine) so once you pick a direction for the box to sit, you want to stay consistent before putting on the final fabric. If you're going for a bit more of a 'wonky' look, it doesn't matter. 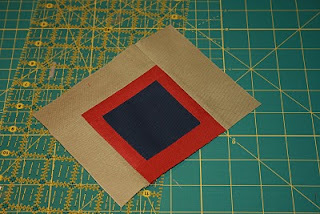 Step 5: Finally, trim up your blocks so that they are completely square. Follow this scheme until you've got your 5 blocks designed. Then I made one of each color combo ... making it easier for me to follow and replicate. 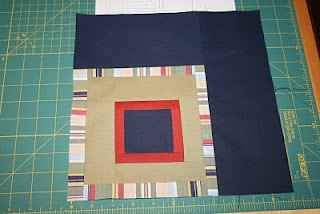 I like negative space in my quilts, so I also chose to use one color to make a few solid blocks. Well ... this is my first tutorial, so please let me know where I can add clarity or if you have a better way to communicate something! Thank you Lisa for taking the time to write this tutorial. Thanks so much! Jessica ... For the top, I bought 1 yard of each color, but ended up with too little of the navy since I used it for the solid suares. So I bought a 2nd yard as I used it for the binding as well. The stripe was a thrifted pillow case which was about a yard as well. I had a little left over, but you'll also note two of the blocks on the back are 'wrong' so there was a little waste as I got my self oriented. I just discovered your tutorial thru Pinterest and love it. 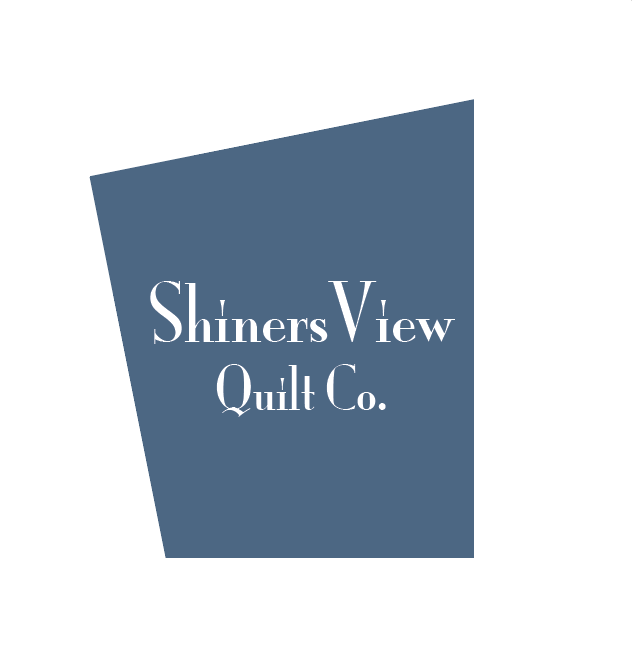 What size quilt did you make? I want to make a queen size and don't know how much material to buy. Thanks. I think you did a fine job on this tutorial. 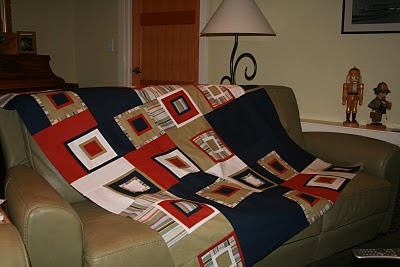 The quilt is the quality of a wonderful artist, and I look forward to making this and adding it to my home. Thanks and keep those ideas rolling. Spotted this on Pinterest some time ago and am just now checking it out. 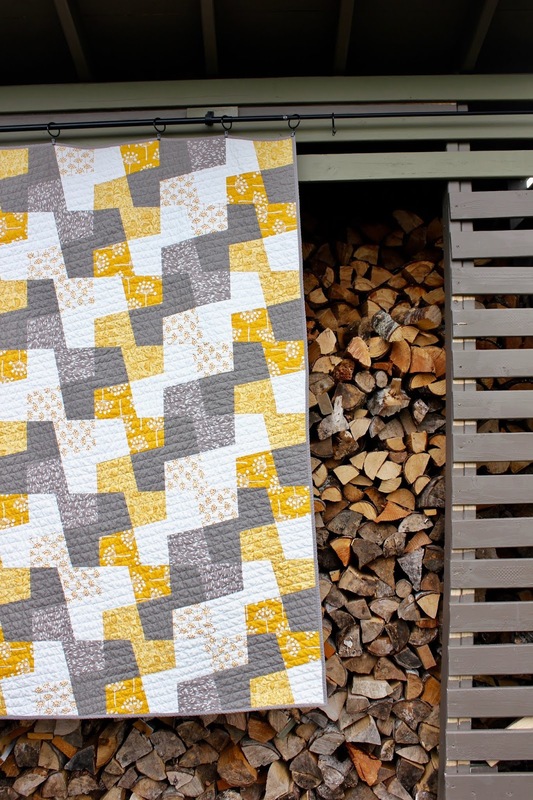 Great tutorial, awesome quilt! 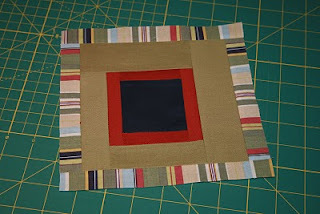 I love this quilt and your tutorial! I may have missed it, but I was wondering what the finished size of each block is? Thank you so much for this inspiration! She got the job !!! Now it's time to "create"